On New to The Arsenal we'll look at the signings Arsene Wenger made during the Summer transfer window and look at each individual player's performance and analyse their input into the game. Today Joss Bennett looks at the impact Per Mertesacker has made to this Arsenal team since his summer move from Germany. Strangely enough, the signing of the 6’6 German centre-half for £7.8m was the one many Arsenal fans were most excited about. It seems many people – journalists and fans alike – expected Arsenal’s set-piece problems to be instantly solved by signing a big centre-half who would give the defence added aerial prowess. Unfortunately, it hasn’t quite worked out that way and the big German seems to have created more problems than he’s solved so far this season. Aside from a couple of excellent performances, Per Mertesacker will probably accept that he has been largely average this season. But we shouldn’t be all doom and gloom. As mentioned, Mertesacker has had some fine games for the club and if you’re only as good as you’re last match, then Arsene Wenger’s fourth centre-back signing in three years (who says he never buys defenders?) should receive plenty of praise. 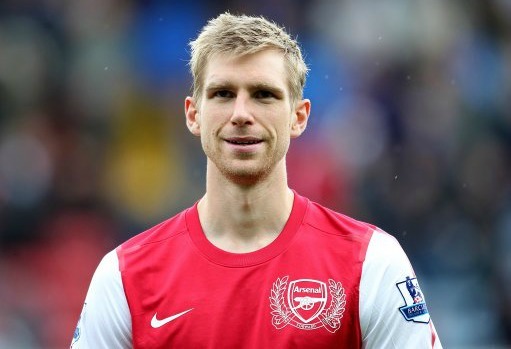 Interestingly, Mertesacker’s statistics from last season – 3.5 interceptions and 1.3 tackles per game* – suggest he was the more pushed up defender in his partnership; in charge of making interceptions high up the pitch while Sebastien Prodl swept behind him to cover for any mistakes. A similar tactic was used at Arsenal last season, but this year he has only averaged 2.1 interceptions and 0.7 tackles per game, compared to Laurent Koscielny – his usual partner in central defence – who has made 3.2 interceptions and 2.7 tackles per game*. Of course these statistics could be read as Mertesacker simply having a poor season – at least compared to Laurent Koscielny. Looking at his games, however, it seems that Wenger has abandoned the “stopper/cover” tactic (to borrow some Football Manager terms), in favour of a more traditional defensive partnership that sees both players holding the same line. Take the Bolton Wanderers game in the Premier League, for example, where Mertesacker attempted 83% of his tackles and interceptions in the middle third of the pitch, and the other one was in the opposition box. By comparison, Koscielny (in the same game) attempted 55% of his tackles and interceptions (and 75% of his interceptions alone) in the middle third of the pitch**. Furthermore, while Mertesacker made three successful clearances (one non-headed), Koscielny made just one more (two non-headed), suggesting the two players had similar instructions during the game**. The change in defensive instructions may be a sign that Wenger is deliberately altering his tactic on a game-by-game basis and looking to accommodate Mertesacker’s lack of pace – perhaps not trusting the full-backs to actually defend enough and prevent the sweeping centre-back covering three positions in addition to his own under the old tactic. This analysis may be supported by evidence from the WBA game, where Thomas Vermaelen made 80% of his interceptions in the middle third of the pitch. In contrast, Koscielny completed more than twice as many (five) tackles as Vermaelen (two), with 56% of them coming in the defensive third**. On the other hand, this slight change in statistics could also be down to Vermaelen’s naturally aggressive approach and Arsenal’s dominance during the game (meaning WBA didn’t threaten behind and the centre-backs were comfortable pushing up). Whether the new tactic will work in the long-run will be decided by the understanding Koscielny and Mertesacker form when the latter has properly settled in a completely different league than he is used to. If they push too high up, it promises to be a nervy season for Gooners as sides will constantly look to take advantage of the gap behind them and lack of covering defender. It remains to be seen how much Mertesacker will even be played – Koscielny’s form and Vermaelen’s reputation suggest Wenger may decide on a game to game basis and the German may have to wait to play against the more physical sides. Fortunately for Mertesacker, he seems to have found form just as the rest of the team have – in his last five games, he averages a solid 6.8 whoscored rating. In such, Mertesacker has largely been able to avoid too much criticism (partly because the whole defence has been blamed, rather than specific individuals) and instead has worked on his game and steadily improved. Now he needs to work on his consistency and hope for a run of games – if he can keep on improving, this signing may be all it was meant to live up to.